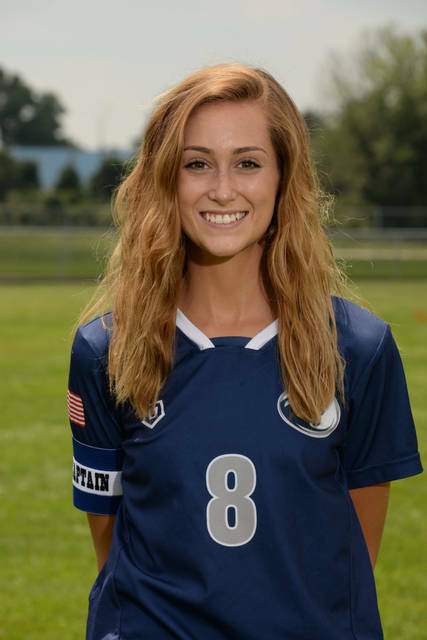 BLANCHESTER – Senior Emily Hinkle extended her scoring streak to four games as she netted the sole goal in a 1-0 Blanchester victory Tuesday over Bethel-Tate in SBAAC National Division play at Barbour Memorial Field. The Ladycats found success playing the ball through Hinkle throughout the first half. However BHS was unable to capitalize, missing several shots by mere inches, with one shot from Bri Haun careening off the post, Blan coach Kurt Ballinger said. Despite Blan creating the more dangerous chances, the game entered halftime tied 0-0. But less than two minutes into the second half. Hinkle, the Ladycats talisman who routinely shows up in big moments, Ballinger said, played a nice 1-2 with Savanna Shank before slotting the ball on the ground to the corner of the goal to take the lead. Hinkle has five goals on the season and has scored in every match so far for the Ladycats. Blanchester continued to press the attack, but had two goals by Lana Roy and Haun disallowed after being judged to be offside, which kept the game close and hard fought all the way to the end, the BHS coach added. The Ladycats defense was well up to the task, with a back line of Olivia Gundler, Sally Schafer, Lacie Tedrick and Lili Morlan all playing the full game in hot conditions, shutting down most chances and teaming with keeper Regan Ostermeier to notch the team’s second shutout of the year, said Ballinger. Ostermeier had seven saves, pushing the career shutout record to 18. Bri Wilson put in a workman-like shift as a defensive midfielder and stood out with her strong play, according to Ballinger. Blan moves to 2-1-1 on the season and in SBAAC National Division play and take on Clinton-Massie on Thursday.